This is my first guide and I kept it fairly simple. Feel free to ask questions if you want clarification on something, or make critiques. -Can do all content easily including lab farming, deep delving, uber bosses, etc. These are not an accurate indicator of DPS, but some people like to see them to compare to other builds using the same skill. The default tree is level 100, but there is also a level 90 and level 80 variant included. All buffs in the configuration will mostly be up 100% of the time. Frenzy charges will in general not be up at the start of a Shaper/Uber Elder fight as they require killing adds, so you can disable them if you desire. We also generate power charges from assassins mark, but because it is inconsistent I don't have them enabled. We have a chance to gain onslaught on kill as well, but this is disabled for the same reason. When you are mapping, this will generally be up 100% of the time, however. Pretty self explanatory. 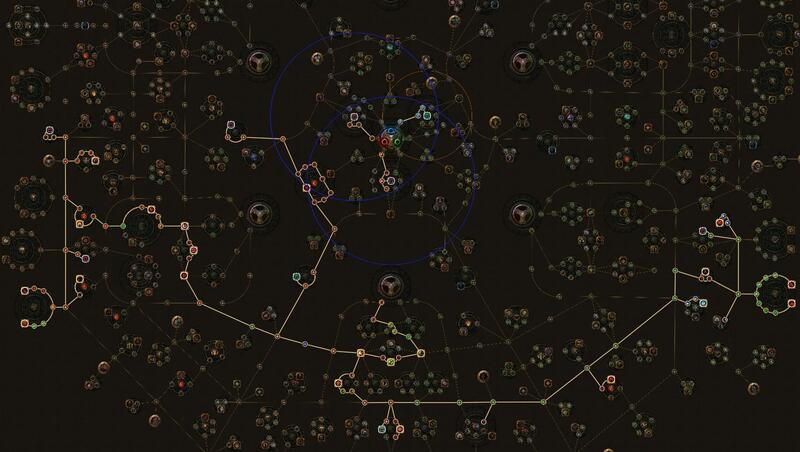 To see what the nodes do, go to the PoB. We take Champion + Path of the Duelist in addition to Inquisitor. Champion gives us permanent Intimidate and Taunt + 10% more damage taken by taunted enemies, as well as permanent Fortify and an 8% movespeed bonus, which is always nice for Cyclone. Inquisitor gives us permanent Consecrated Ground on bosses, which provides us with 100% increased crit chance (currently NOT calculated in PoB afaik) and grants complete status immunity while standing on it. We also get 30% crit multi 6% ele pen, and 10% more ele damage taken by enemies. Alira for all resist and crit multi. A very efficient choice. The main benefit of this pantheon is that it gives us 50% increased recovery rate for 4 seconds every time our immortal call procs, which helps for not dying to burst damage while you are not attacking. It also reduces the damage of our blood rage. Soul of Solaris can also be a solid choice for the "take no extra damage from critical strikes if you've been crit recently". You can use this if you prefer. This further reduces the damage of our blood rage, and gives us immunity to blind/maim, as well as a chance to avoid bleeding. Swap out Conc Effect for Increased AOE for general mapping. 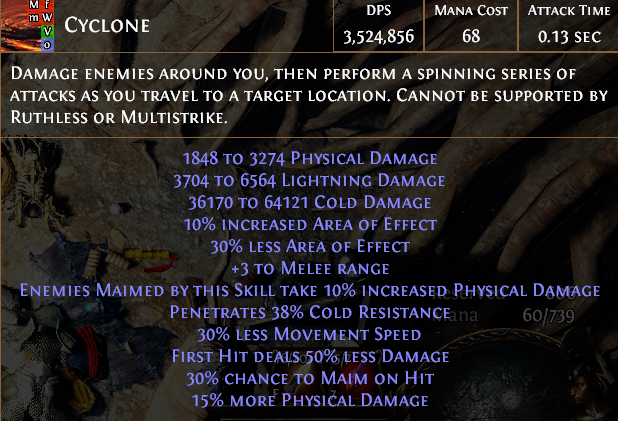 Lets us move around very quickly when not using Cyclone, and is good for fast dodging. Because we link it to Blood Magic, it also is useful for instantly regaining your mana if you go OOM. Hatred is the most important aura by far, Dread Banner is second. The impale from Dread Banner is not important, but it gives us 100% increased effect on our Fortify (when placed), and reduces enemy accuracy. Vitality is just used for the 30% recovery rate from watcher's eye, but is absolutely not required, as we use instant leech. I recommend using Herald of Purity if not using Vitality. This ability gives us bonus damage, and also deals quite a bit of damage itself. It's especially useful for fighting waves of enemies in delve/breaches and on bosses. It can even tank Shaper beams! We use this to proc our Punishment* curse and Immortal Call, as well as Lightning Golem. You can also self cast Lightning Golem if you want to use a higher level one. *Elemental weakness is also a great option here, slightly less damage but a bit more consistent. You can put this anywhere you want. I have it in my CWDT 6L, although CWDT does not proc it, it gets the benefits of the increased duration support. 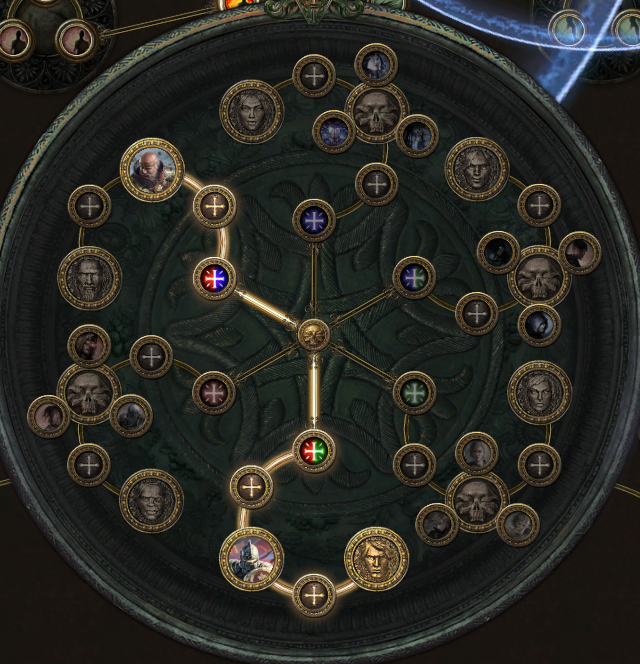 Legacy Atziri's Acuity is key for this build. It gives us instant leech, and provides us with more than enough int for all our gems. Our 2H Sword gives Hit's Can't be Evaded, which is a huge damage boost and makes worrying about accuracy completely unnecessary. Our chest makes our Cyclone a 7-link by adding Maim, and allows us to use two curses. Hypnotic Whorl is also a great item and gives us our second curse whenever we hit: Assassins Mark. This curse grants us base crit and extra crit multi, as well as power charge generation when we kill. For our helmet, we use a rare helmet to help cap out our resists, as well as provide additional cold penetration. 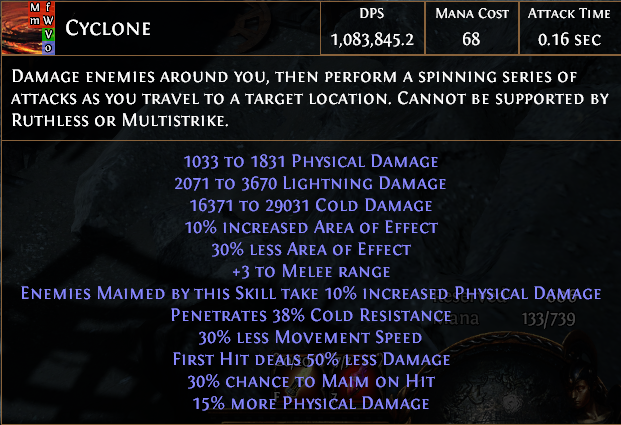 40% Cyclone Damage is the preferred enchant. If you are using different gear and don't need the resists from a helmet, you can also use an Abyssus for a huge damage boost. However, this is completely unnecessary as we already have enough damage to kill any boss in the game in seconds, and insta-phase Shaper and Uber Elder. It also makes you squishier. Most of these are self explanatory. Curse Immunity on Diamond Flask is crucial for fast mapping and not worrying about increased damage taken from curses. Taste of Hate is amazing for damage and survivability. Make sure your cold resist is always at least equal to your highest uncapped resist, so you get an additional 20% cold penetration from The Wise Oak. The most crucial jewels are Watcher's Eye with Cold Conversion and Cold Penetration, and 2x Might of the Meek + Unnatural Instinct. 2x Might of the Meek + Unnatural Instinct gives us a massive damage boost as well as a ton of extra life and resistances. One of my Might of the Meeks also gives immunity to Corrupted Blood. Get a jewel with this, it doesn't have to be a Might of the Meek. Watcher's Eye cold damage conversion brings our total cold conversion to 80%. With the additional penetration, it brings our total cold penetration to a whopping 98%, which will easily reduce the cold resistance of any monster in the game into the negatives. For the rest of your jewels, focus on %life + crit multi and attack speed. You can also get some elemental resistances from these if needed. For Abyss Jewels, You want flat life + attack speed if you've crit recently. You also want % chance to gain onslaught on kill on at least 1 abyss jewel for faster mapping. This variant of the build uses theoretical items that could be obtained on the Synthesis League. It is still extremely high budget. Since we no longer have access to instant leech via legacy Atziri's Acuity, we instead use Tombfists, and drop the Champion ascendancy in favor of Slayer. Since we don't have instant leech, this version has a heavier focus on life recovery rate increases to maximize our leech/sec. 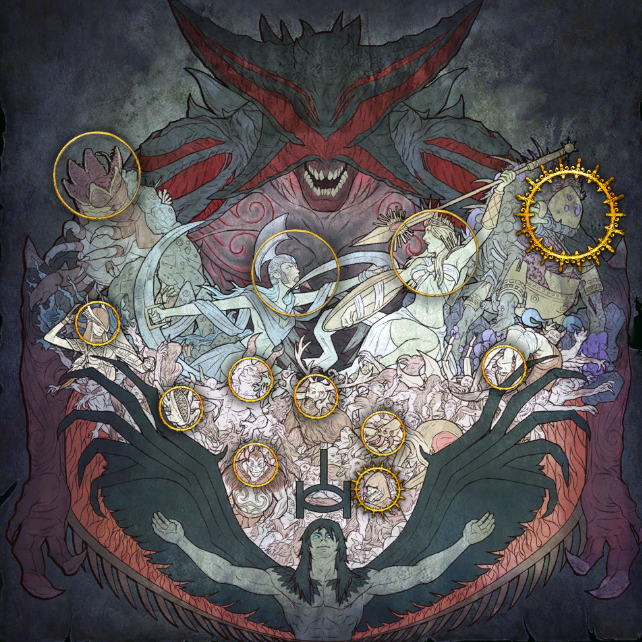 By getting recovery rate on an Elder belt, and taking Vaal Pact, we reach a cap of 92% of our max life leeched/sec. We also make use of the implicit mods available on synthesized items. Instead of an Elder chest, we can get a synthesized chest that grants us permanent power/frenzy charge generation as well as additional crit chance on the implicit. We also can get delve hybrid life instead of %life elder mod, and 25% increased aura effect instead of +1.5% to attack crit chance. We get an Onslaught implicit on boots for permanent Onslaught. Because we get Onslaught from this, we don't need "chance to gain onslaught on kill" from abyss jewels. The only other major difference is that we use non legacy versions of Taste of Hate, The Wise Oak, and Lion's Roar flasks. Dude, thx for this build. But how about leveling and leveling skill tree plz? I have now added a level 80 and level 90 variant to the Path of Building pastebin. You can swap to these using the drop down menu at the bottom left of the tree. I also added priorities for which ascendancies to choose first to the ascendancy section. As for gear while leveling, just use typical leveling uniques like Tabula and Goldrim etc. I didn't include detailed leveling instructions, because this build doesn't really shine until you get your endgame items. As a cyclone lover i have to say congratz for your work. were obligated to mirror items in order to proceed for greatness. I like alot the overall idea and the overall itemization. Cyclone lovers United We Stand. Thanks for the kind words. Hopefully Cyclone and other melee skills receive some deserved love in 3.7! I generally don't like crafting my own items as I hate gambling, but I am proud to say that I crafted the helmet myself! i cant get legacy atziri's in current league? Correct. This build is one which requires Standard gear. However, I plan to add a Synthesis League variant later today. Added a Synthesis league variant section.